Our Mission at Hawa Bamboo Flooring Trading Corp.
HAWA bamboo products are manufactured to the company's specifications set by a team of factory inspectors to meet the stringent U.S. building standards. 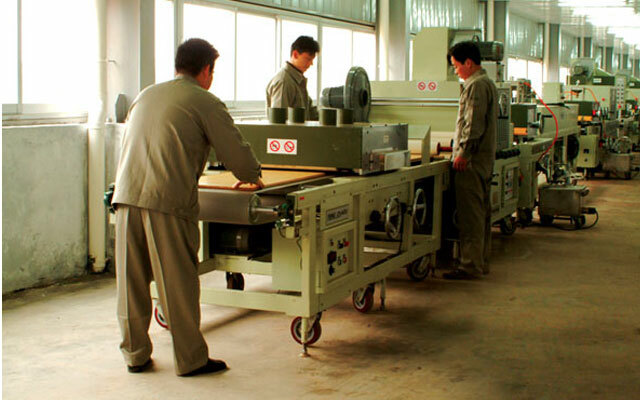 This factory is ISO 9001:2000 and 14001 Certified with 11 quality control inspection stations within the production process. A quality control engineer performs spot checks throughout the entire production line as the material is being produced. The culms of the bamboo plant grow to height of 80 feet and diameters of up to 8 inches. A date is etched into each bamboo stalk to indicate appropriate harvest time to maintain sustainability. The MOSO specie of bamboo specified by HAWA is harvested at 4 to 6 years for a more durable finished product and to ensure stability and clarity of color. Unlike hardwood trees requiring more than 60 years to mature, bamboo is a grass that is renewably harvested over and over from the same plant. HAWA takes it one environmental step farther by virtually eliminating the formaldehyde level of the adhesive used in the lamination process. In addition, the company specifies a water-based, solvent free, 100% solids finish in the manufacture of its prefinished line of products. The bamboo stalk is split into slats to extract the premium part of the culms. The slats are then laminated with an environmentally safe adhesive under hydraulic pressure to produce planks for flooring, panels and veneer. The slats of bamboo are boiled in a solution of water, hydrogen peroxide, and borate solution to eliminate pests and mildew, then kiln-dried to remove moisture. The slats are kiln-dried to a minimum of 5% and a maximum of 8-10% moisture content. Raw flooring blanks are stored in a humidity-controlled warehouse for 2 weeks to achieve 8%-10% delivered moisture content. Flooring planks and flooring accessories, such as moldings are produced to yield uniform pieces free from any flaw that will produce tear-outs or voids within the final product. The first finish application for HAWA prefinished flooring is the sealer coat followed by the aluminum oxide coatings that protects the fiber. Next is the aluminum oxide coating, followed by high quality polyurethane coating for easy refinishing. The Hawa Carbonized bamboo flooring is produced by pressure heating the natural bamboo fiber. The longer period of time that the natural bamboo is subjected to heat, the darker the sugar compounds become and thereby producing a carbonized color.